While in university, Kenta Nakano originally aimed to become a cuisine chef. His enrolment in Le Cordon Bleu's pastry diploma program was a result of his belief that pastry knowledge was necessary for success in cuisine. At Le Cordon Bleu, Nakano was taught long-standing French classics, such as Gâteau Mocha, Mirroir Cassis, and Montmorency, pastries rare even in France today. Learning such traditional French pastries is very useful. Pastries continually evolve, but knowing their roots is very important. I'll never forget the flavour combinations. Even when I create new pastries, no matter how modern, they inevitably become French. 14 years after graduating, Nakano is now the chef at the reputable Dalloyau Japan, responsible for adapting classic recipes to succeed in the Japanese market. On display in showcases of the famous pastry shop are not just traditional French pastries, but examples of French recipes reconstructed for Japan, like "Zen Extreme", made using matcha. The most amazing thing about French pastries is its versatility. Even using Japanese ingredients, it can still be French. This freedom is what I like about it. What Nakano humbly doesn't mention is that it takes a certain level of expertise to successfully pull off seamless combinations of French technique and Japanese flavours. But he does, and it's like he's a figurative bridge between Paris and Tokyo. I would argue that Japanese pastry techniques are on par with those of the French. Japan introduces a lot of goods that are well-suited to the Asian market. It is also a unique place in which one can personally experience French or global trends. At Le Cordon Bleu Japan, you can learn the pastries that people want, and then using what you've learned you can adapt them to what the Asian market needs. And to me, Japan is the best place for that. Born 1980. Completed Le Cordon Bleu's Patisserie Diploma in Tokyo and Paris. 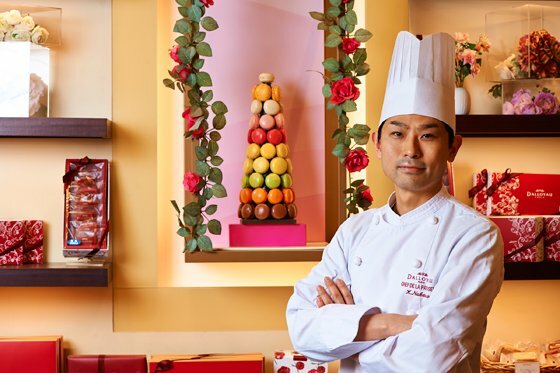 Worked for various pastry shops and kitchens such as JOUVAUD in Hiroo (Tokyo), and Hôtel Plaza Athénée . Overall runner-up in Charles Proust Competition in 2008. Started as Dalloyau Japan's pastry chef in January of 2012.